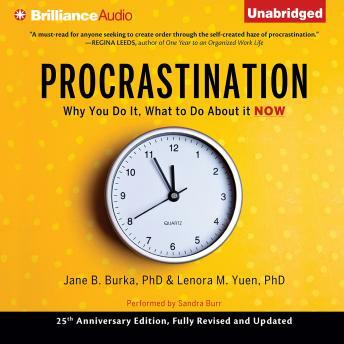 Based on their highly acclaimed and groundbreaking Procrastination Workshops and drawn from a wealth of shared counseling experience, psychologists Jane B. Burka and Lenora M. Yuen offer a probing, sensitive, and sometimes humorous look at procrastination, a problem that affects everyone: students and scientists, secretaries and executives, homemakers and salespeople. By identifying and examining the reasons we put off tasks in the first place - fears of failure, success, control, separation, and attachment, as well as our concept of time and the neuroscience of our brain - Procrastination lays important groundwork for learning how to understand the impulse to delay and how to take action in new ways. Burka and Yuen's is a practical, tested program designed to overcome procrastination by achieving goals, managing time, enlisting support, and handling stress. It takes into account the demands of an accelerated, 24/7 culture, as well as the impact of such neurocognitive conditions as ADHD and executive dysfunction. It even provides helpful tips on living and working with the other procrastinators you may know. Wise, effective, and easy-to-use, Procrastination is an immediate must-have for anyone who wants to avoid putting things off until tomorrow. Don't postpone listening to it today!